Sayid's life is in danger after finding the source of the French transmission, while Hurley hatches a ridiculous plan to make life more civilized. Boone: You're never going to believe this. Shannon: You finally learned how to tie your own shoes. Boone: Funny. Someone at the caves built a golf course. Like its predecessor Confidence Man, the ninth episode of Lost, called Solitary, is a solid character study that also digs a little deeper into the show's mysteries, whilst retaining a lighter side to avoid slipping into complete darkness. 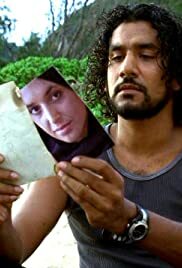 This time, the "main" character is Sayid, who's suffering from a guilty conscience after torturing Sawyer (and nearly killing him in the process). Taking a solitary walk around the Island to find out where the radio transmission came from, he's suddenly abducted, imprisoned and, at one point, tortured (there it goes) by a mysterious French woman (Mira Furlan). She identifies herself as Danielle Rousseau, the one who sent the distress signal, and the sole survivor of a science team that was stranded on the Island and got into conflict with the "Others". During the conversations with Danielle, Sayid remembers his own past, and it is revealed - though it doesn't come as much of a surprise - that he used to be a torturer acting under Saddam Hussein's command in Iraq. During one of his assignments, he had a chance encounter with childhood friend Nadia (Andrea Gabriel), who he helped escape from the prison facility with dire consequences for himself. While the back-story doesn't strike as particularly surprising (the previous episode gave it away somehow), the drama that comes with it is handled very well, and the scenes with Naveen Andrews and Gabriel are among the most moving in the series so far. More interesting, though, is the new details added to the ongoing mystery of the Island, with suggestions of hitherto unseen enemies and plenty left to say about Rousseau, another character with a philosophically relevant name (unsurprisingly, the real-life inspiration, Jean-Jacques Rousseau, was connected to one John Locke). Additionally, the episode offers plenty of humor, courtesy of writer David Fury (a Buffy and Angel veteran), who gives Danielle the ironic line "There's no such thing as monsters" and finally provides the survivors with an outdoors activity: golf. Question is, how much time will they have for it with all the weird stuff happening around them?